If you’re looking for a horse trailer for sale or box trailers for sale then you’re definitely going to want to check out the online inventory of Yucaipa Trailers, the trailer company that has an inventory 10 times larger than the average dealer in the US. They are experts at providing you with top-quality trailers of all kinds of keeping their prices affordable so you won’t have to go over your budget. Yucaipa Trailers also has over 25 years experience in the business and is family owned and operated. 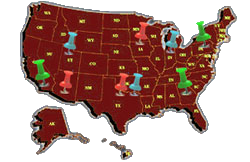 They have multiple pickup and drop-off locations across the country so that you have access to the trailers you need. You wouldn’t trust your precious horses to just any old trailer would you? Get the highest-quality horse trailers from Yucaipa Trailers and keep them safe while transporting them in style. There horse trailers are designed for efficiency and durability so that you can have peace of mind when transporting your horses. When it comes to box trailers Yucaipa Trailers has exactly what you need. You can look at their online inventory to see what other options are available for you and also get an online price quote by speaking to an online representative when they are available.